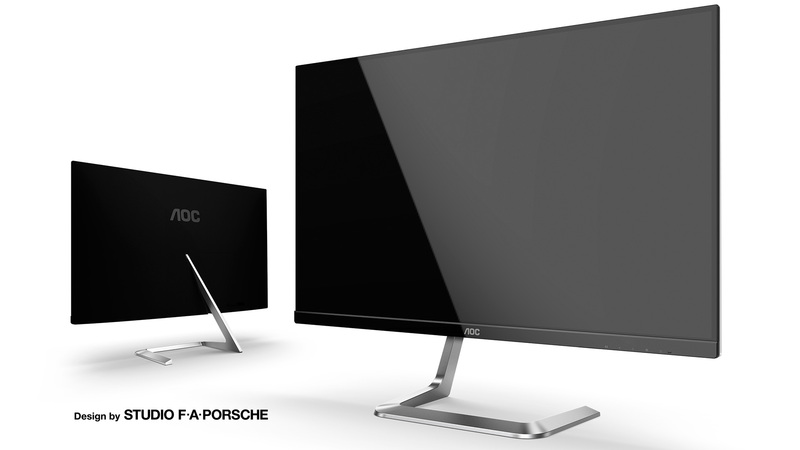 AOC has announced two new monitors designed in conjunction with Studio F. A. Porsche, while also confirming that its 35” ultrawide curved G-Sync HDR screen is finally coming out this year. AOC has worked with the Porsche design studio in the past, but the two new screens represent something of a renewed push for the brand as it targets ‘design-conscious home users’. First up is the halo product, the U32U1 (below), which AOC has revealed as being a Red Dot Design Award 2019 winner. It uses a 31.5” IPS display that AOC describes as best in class and that features a 4K (3,840 x 2,160) resolution, 60Hz refresh rate, VESA DisplayHDR 600 compliance, and 90 percent DCI-P3 gamut coverage. HDMI 2.0, HDMI 1.4, and DisplayPort 1.2 connectors (one apiece) are joined by a USB Type-C port that allows for notebook docking and charging with up to 65W of power delivery. There’s also a four-port USB 3.0 hub (AKA USB 3.1 Gen 1 and USB 3.2 Gen 1…). The tubular metal tripod stand offers height adjustment of 120mm, swivel and tilt mechanics, and the ability to pivot into portrait mode without displacing the cables thanks to the backplate design. It’s frameless on all four sides, but there is still a small in-panel border. AOC is expecting to charge a hefty 800 Euros including tax (roughly £690 at the time of writing) for the U32U1 when it launches later this year. The second screen is the smaller Q27T1 (above) which is expected to launch in July for 269 Euros including tax (about £230 at the time of writing). This is a 27” IPS panel with a 1440p (2,560 x 1,440) resolution and 60Hz refresh rate with 90 percent NTSC colour space coverage and a claimed 1,300:1 contrast ratio. It has fewer features, so no HDMI 2.0 or USB-C, and the asymmetrical stand is limited to tilt mechanics only but is structurally engineered to balance the monitor’s weight and hold it in place, with influence for this design drawn from sculptures. 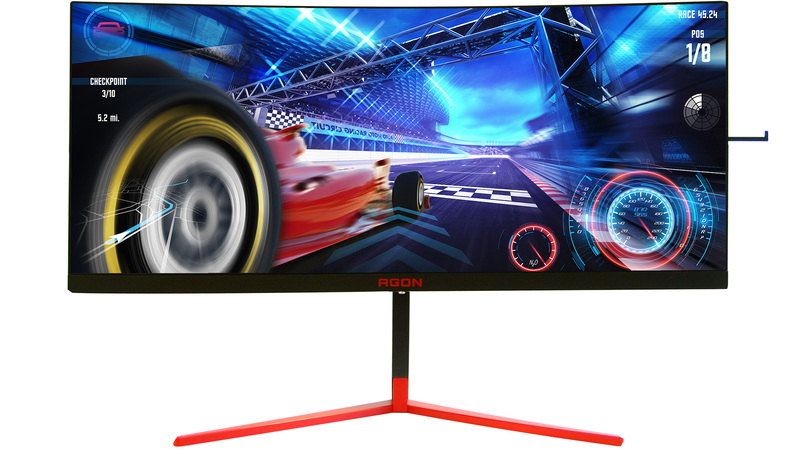 AOC has also released full details of the upcoming AG353UCG G-Sync HDR monitor (below). This screen has been known about for some time, but now it has an official press release! AOC is targetting a September/October(ish) release date, having experienced power delivery issues that are currently being ironed out. 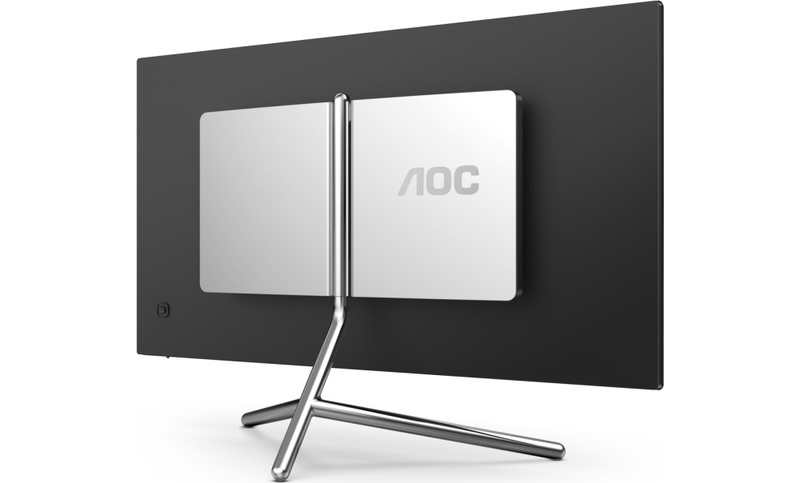 The feature list of the AOC Agon AG353UCG, to give it its full name, is undeniably impressive. The 35” VA display (from AU Optronics) carries a 3,440 x 1,440 resolution (21:9 ratio), a 200Hz peak refresh rate, 1ms claimed response time, and of course Nvidia G-Sync HDR. With 1,000 nits of peak brightness, the screen qualifies for the VESA DisplayHDR 1000 standard and supposedly offers a 2,000:1 contrast ratio and 100 percent DCI-P3 gamut coverage as a result of a Quantum Dot coating. 512-zone Full Array Local Dimming is also featured. The design is described as ‘three-sides-frameless’ with plastic edging only really apparent along the bottom edge. It also has RGB ring lighting on the back, 120mm height adjustment, and VESA 100 mounts. DisplayPort 1.4 is included and is needed to use G-Sync and 200Hz; the solo HDMI 2.0 connector caps out at 100Hz at the native resolution. Pricing has not been disclosed, but given that it’s going to go head to head with the Asus ROG Swift PG35VQ and Acer Predator X35 we would expect it to be suitably expensive.